In honor of Women's History Month, please join New Plains Student Publishing on Monday, March 11th from 10:00am-11:00am in LAR 211 for brunch and brilliant, bold, and brainy discussions about what we, at NPSP, do and can do to promote women in the industry. Lit at the Lab- What a great time! Lit at the Lab- Thanks to all who attended! 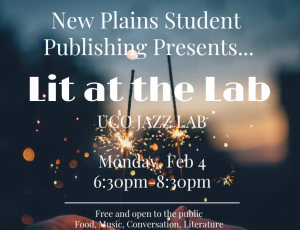 New Plains Student Publishing presents Lit at the Lab Monday, February 4th, 2019. Please join us for food, music, conversation, and literature at the UCO Jazz Lab (100 East Fifth Street, Edmond, OK 73034) from 6:30-8:30 PM. New Plains Student Publishing is excited to announce Morgan Christie as our 2018 Chapbook contest winner! 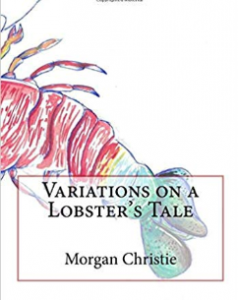 Her work, Variations on a Lobster Tale, can be found for sale on Amazon. Save the date for our forthcoming Sherman Chaddlesone Arts & Letters Lecture Series Monday, October 14, 2019. More details available soon. This event is always free and open to the public. New Plains Student Publishing presents a time of Fiction and Flan, Pastries and Poetry. 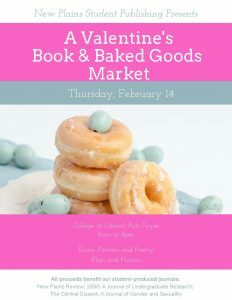 Please join us at the College of Liberal Arts Foyer from 9 AM to 4 PM to buy some books and baked goods.